CVA – Port P1375 – The Pollard Lilliputian Opera Company on the steps of Vancouver’s Badminton Hotel, ca 1905. R. H. Trueman photo. Vancouver Daily World. 27 June 1903.
comic/light operas (what are often called, today, operettas). I could find no documented indication of what production they offered in Vancouver in 1905. But a theatre listing in Nebraska at roughly the same time showed the group staging Romeo and Juliet. The man in about the third row, right appears to be Tom Pollard, the well-respected leader of the group. 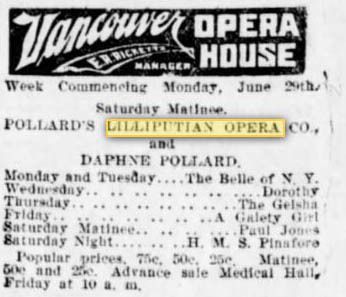 An advertisement of an earlier Pollard performance in Vancouver appears below. The troupe was posed in front of the Badminton Hotel (southwest corner Howe and Dunsmuir). The image below shows what the interior of the Vancouver Opera House (adjacent to Hotel Vancouver #2 on Granville Street) might have looked like around the time that Pollard’s Lilliputians were in town. 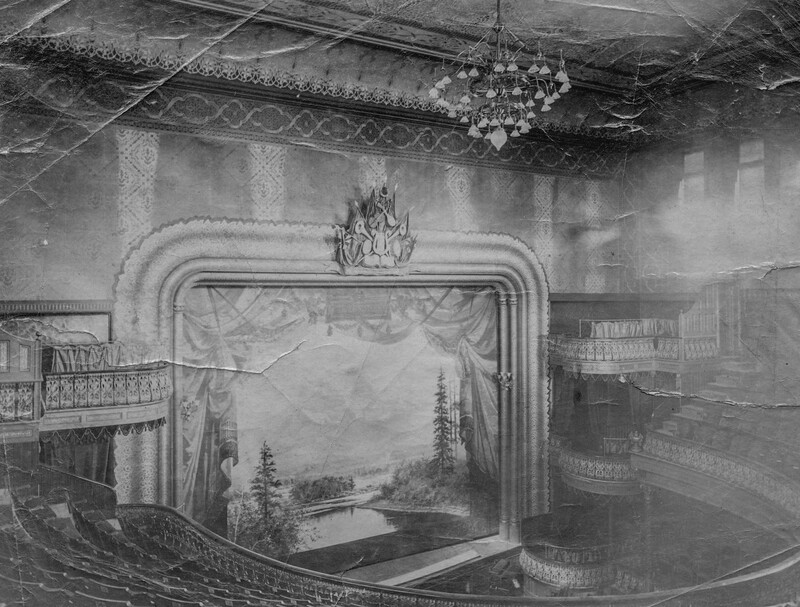 CVA – Bu P7 – [Interior of the Vancouver Opera House – 733 Granville St.] ca 1891 (Note: The original image at CVA has been modified here by cropping out tears and missing parts of original image as well as making the yellowed original into a b/w image). This entry was posted in people, R. H. trueman, theatre/vaudeville/cinemas and tagged badminton hotel, bc, child actors, comic opera, history, light theatre, Pollard's Lilliputian Opera Company, theatre, tom pollard, touring theatre companies, vancouver. Bookmark the permalink. A great photo! 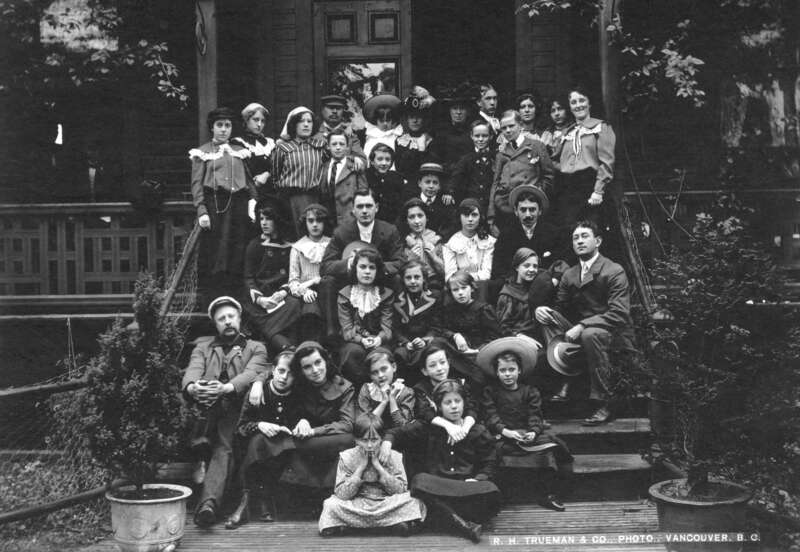 The outstanding Daphne Pollard (Daphne Trott) appears to be front row, right with the big hat, while Alf Goulding, Snub Pollard (Harry Fraser), and Teddy McNamara are probably the group of boys standing at the back. I have their program for the Montreal performance in late November 1905, and the weekly program included “A Run Away Girl”, “The Belle of New York”, “A Gaiety Girl” and “The Geisha”. Thanks for the info. And for commenting! I have used 2 small enlargements of Daphne Pollard and Alf Goulding on my own new WordPress page and while your site is linked and acknowledged, I realize I haven’t done the courtesy of asking if that is OK! Happy to acknowledge differently or remove and simply point readers to your site. Please advise. Sure, this is fine. Thanks for acknowledging VAIW. And congrats on your new WordPress site. Hi Nick, Just thought I’d ask whether the program lists the other actors in the photo. My great grandmother Lily Thompson worked for Pollards around this time. There is a Lily Bull in the program and an Eva Thompson. Or did she use a stage name as so many in the company did? Even if she wasn’t on this tour, she may have been in one of the other company branches. Peter Downes, a NZ writer has produced a book on the Pollard company. My WordPress page on Daphne Pollard has a couple of enlargements of cast lists from Montreal Nov 27 1905. My Great Grandmother Midas Alice Martyn and her sisters May Curtis Martym, Ivy Annie Martyn and Connie Elizabeth Martyn were in Pollard’s Lilliputian Opera Company. My grandmother had her mother, Midas’ diary. On 3rd Jan 1903, they sailed on the ship Changsha to Hong Kong, opening at the Victoria Opera House and were in The Belle of New York, Geisha Girl, Gaiety Girl, Mikado, Dorothy, H.M.S Pinafore. then went to Japan – Kobe, Yokahame, & Tokyo. Went to Manila in the Philipines for about a month. Went across to Vancouver, Canada – Victoria and some smaller towns. Played at San Fran, California and many, many towns across American and back to Vancouver and returned to Australia. They had been away for 2 years. Then on 1st Mar 1905, they went overseas again on the Empress of India. Went to China, then to Victoria, British Columbia. Then there are about 3 pages listing the dates and towns they visited. One of them is 10th – 18th Nov 1905 was spent at Montreal which matches with what you have said. She also mentions often playing in the Principal Boy show too. Left on Friday, 2nd Feb 1907 and arrived home 27th Feb 1907 onboard the Moana. Where can I go to find copies of programs like what you have? This is such a great photo isnt it!!? Thankyou again VAIW people for contributing so much to Australian theatre history. All those little Australian kids so far from home! Catherine Im happy to send you a scan of the whole program I have which is for the week Nov 27, 1905 and from Montreal. If you go to my wordpress page there is a contact option so we can exchange emails at the bottom. (https://forgottenaustralianactresses.com/contact/ should take you there) I have spent a year trying to track the Pollard’s company across Canada and this photo was a breakthrough! Hello Nick, I am almost 100% sure I can identify my Grandfather and his sister in this photo!! They are in the second row on the left at the back. My Great Aunty May Thomas has her left arm around my Grandfather, William Thomas. The story goes that she was picked to go on this tour but would only go if she could take my Grandfather as well. I have over 50 postcards of this trip that my Grandfather collected including 2 from Shanghai, 1 from Japan, 2 from Suva possibly on the trip home on the R.M.S.Oarangi (1 postcard of it) There are some from Canada and lots from the United States that fit in with the tour years of 1905/6 as many cards are dated 1905 or before. Many include cities of North West and central USA which fits in with them arriving on the West coast of Canada from the Far East. They are unmarked so he never posted them home but obviously was collecting them as they toured. I also still have the remains of his makeup box he had on tour. It still includes fake moustaches and many sticks of grease paint for the makeup. My Grandfather 2 of his brothers joined up went to war in France and Belgium with the A.I.F in WW1 and in 1917-18 he went on leave to London and caught up with Daphne Pollard when she was performing there. I am amazed to see this photo of my relatives, thank you all involved for posting and or having this link, regards Robert Maynard. I notice reference is made to Peter Downe’s book about the Pollard. This book is largely about Tom Sullivan (aka Tom Pollard) NZ troupe. This picture is of Charlie Pollard’s Lilliputians and not Tom Pollards. Hi Robert – I replied to this on my site. Congrats again on the photo, VAIW people! Many thanks again, Mr Murphy. It would be great to find out where you live. Are you in Australia? I’m extremely interested in the postcards, etc. you have. Amazing! thanks so much for responding. She could have been in one of the other company branches. She performed in a lot of vaudiville from 1908 onwards with my great grandfather. i’ll check out the book you’ve recommended.